Outside of the multifamily industry, world-class teams have adopted great apps to automate and optimize their customer service & resident satisfaction processes. Unfortunately, these apps rarely integrate with leading property management systems and do not address the specific needs of property teams. Aptly was designed specifically for the workflows and automation needed to increase resident satisfaction in the multifamily industry. We bring your email and property management data into one centralized workspace, allowing your team to collaborate, share and communicate more effectively. The resident service team is hit with tons of requests ranging from ones that require immediate attention to those not so urgent. 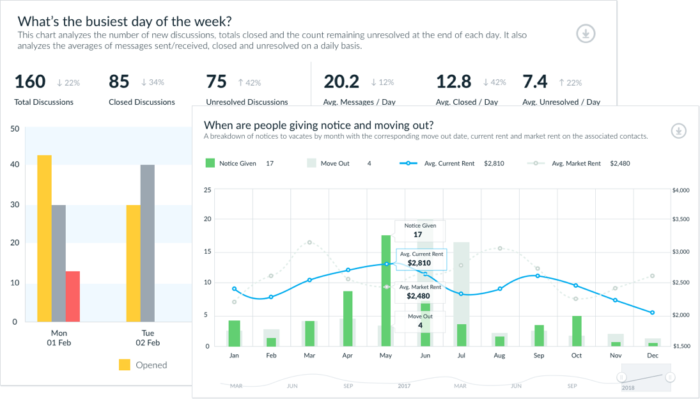 One way to get a handle on these is to setup SLA’s where you can measure your team’s response times and provide reminders for your staff to when they go outside of your established parameters. Want to get back to residents on mold or security issues in 30 minutes? You can easily use Aptly to measure and monitor responses. Do you know your busiest days, hours, or which category of issues takes the longest to deal with? Measuring incoming issues, specifically on email is hard to do since emails are locked away in your team’s personal inboxes. Using artificial intelligence Aptly has mapped the multifamily communication lexicon and can automatically categorize your incoming emails. Learn exactly when and what your team is dealing with so you can provide them the time needed to respond to issues. How much time is wasted jumping between Yardi, RealPage, or any other property management system to look up necessary information before responding to a resident inquiry? Aptly provides all your resident data alongside your email, allowing you to respond quickly from inside one application. 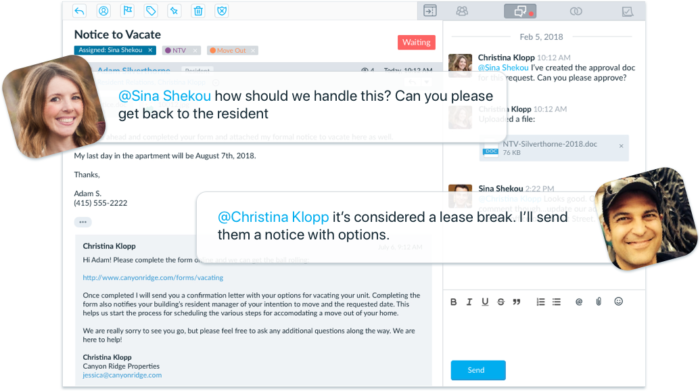 Communication Templates merge resident info directly from your property software, allowing 1-click responses customized for each resident. Collaborating with your team on emails is hard, we’ve all been added to chains of forwarded emails with 20 other team members. Not with Aptly! Using our mention ability is like having team chat beside an email thread. You can easily mention specific team members, ask questions, and comment all without forwarding a single message. Easily collaborate to increase resident satisfaction scores. Aptlets allow you to collect structured data from your website, email or walk-ins. 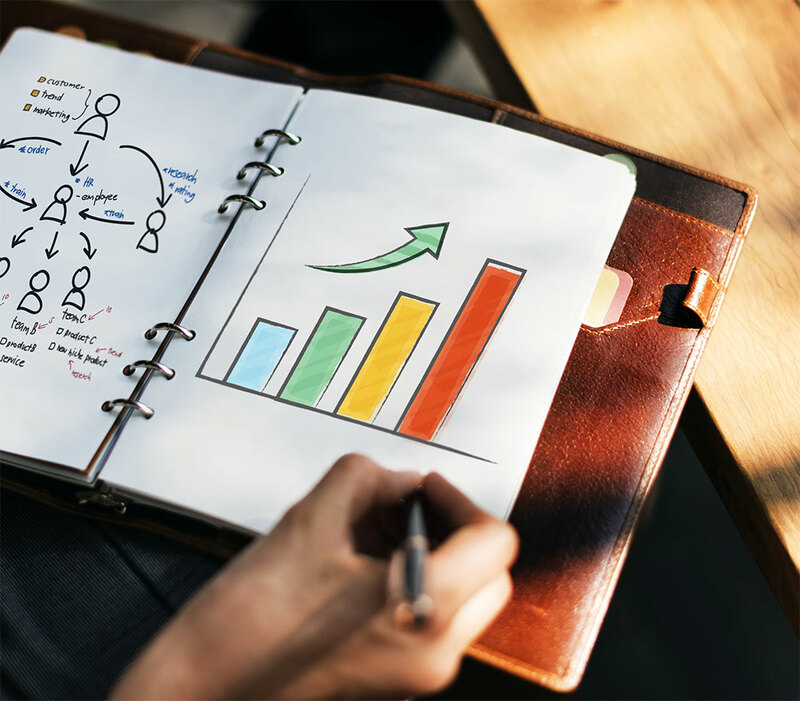 Simply complete a form and the data goes directly into Aptly which allows your team to take action, streamlining data collection, validation and triggering workflows. Aptly is a communication platform designed specifically to address resident satisfaction and communication for property teams. Read more about the NOI value of positive resident satisfaction here.